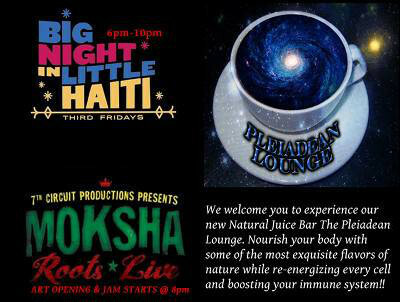 Celebrating the 4-YEAR ANNIVERSARY of Moksha Roots Live in Little Haiti / Little River / Lemon City. The official after-party for The Rhythm Foundation’s Big Night In Little Haiti: Third Fridays. Join us for a gallery opening and exhibition, live music, Djs, and drumming. A monthly event that brings together the diverse cultural roots of South Florida. Tribal Drum Jam with Live Performers! ~ EPHNIKO ~ and Special Guests! We feature our Gallery filled with Local & World Renowned Visionary Artists. Outside juice and snack bar with all organic Kava, Kambucha, Roots Drinks, Samosas and more. $100 VIP, includes open bar and preferred seating! The Miami-Dade County Mayor and Board of Commissioners. Metro1 Community, Rhythm Foundation, Tito’s Handmade Vodka, LaGunitas Beer, Blackwell Rum, Cheetah Lounge, SRX Events, and RedBull.